Oh god, is is time? It's only taken...er forever to get here. T-Minus a few hours before work. 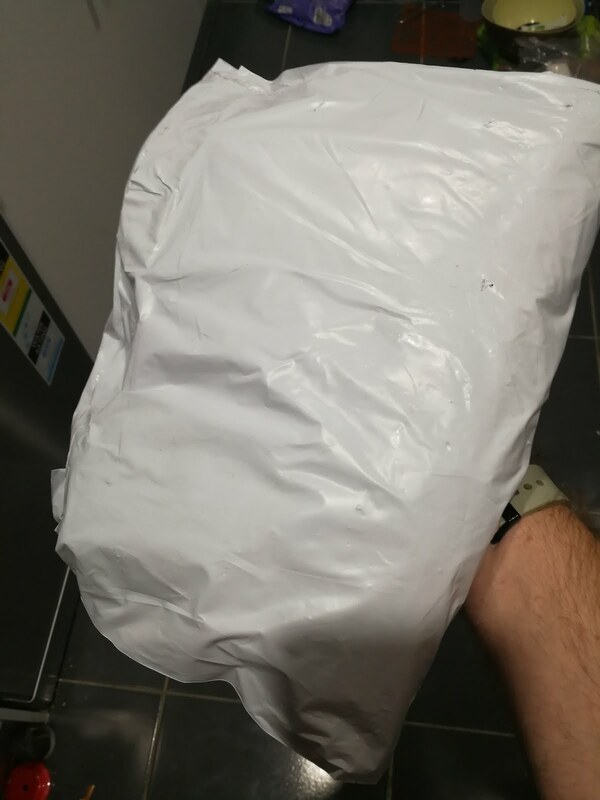 Okay, let's backtrack a few days first when a package arrived. Could this be my Citra Warrior IPA gear ready for a good ole brew weekend? It feels like Christmas. A very hoppy IPA tasting Christmas as I keep pulling out air sealed satchels full of various bits and pieces. Can we make it now?? 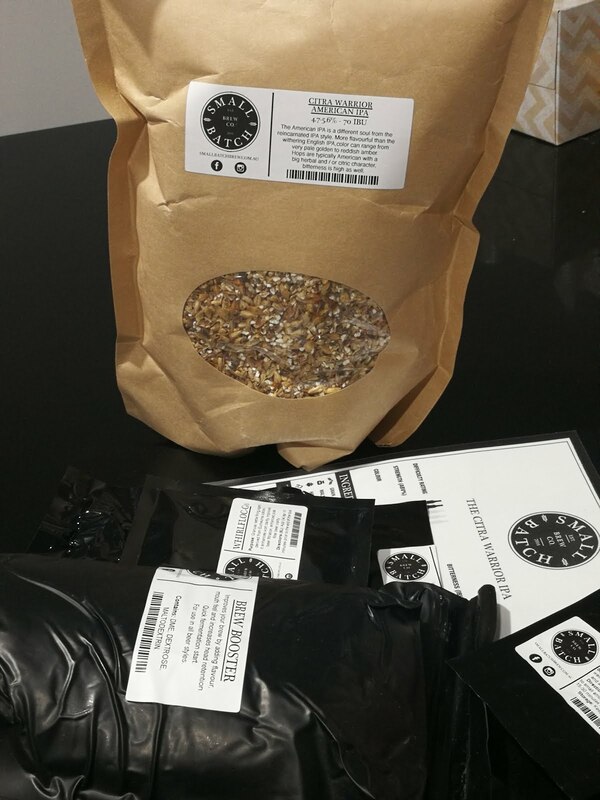 This is the Small Batch brewing Citra Warrior IPA kit which includes everything you need to craft up five liters of the Indian Pale Ale stuff. You can find the recipe and links to buy this fun bag right here. Technically it was on Good Friday but given what I was doing, it warranted a name change. I took some snaps along the way and learnt plenty good and bad along the process, so helpful tips I've found I've highlighted in red. Firstly we're going to sterilize everything. Everything? Yes, everything. 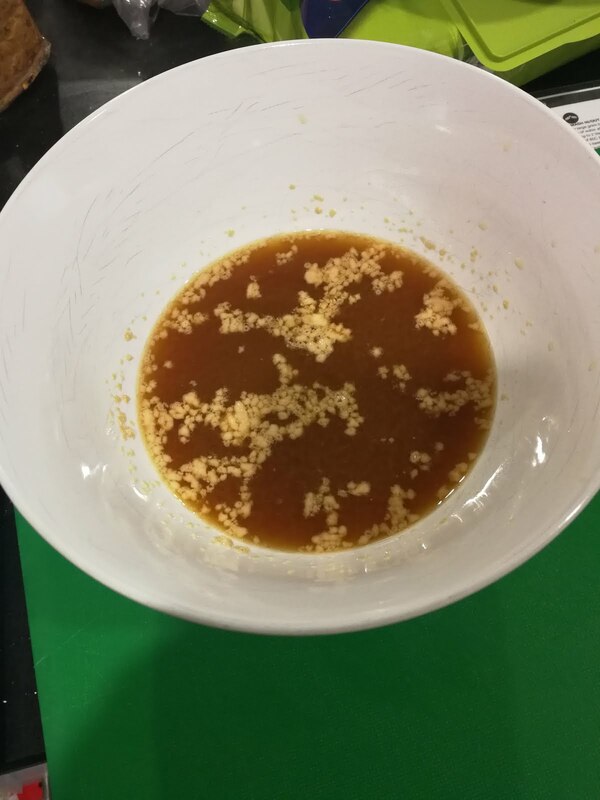 It's the first step on the recipe card so lets not kick things off on a bad note by missing that one. Thankfully if you're like me and forget to buy some Starsan sanitizer there's a small pouch of sodium bicarbonate in the kit. 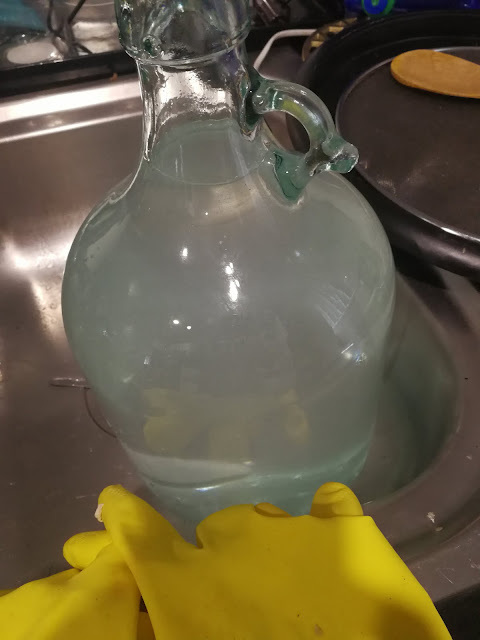 It's odor and taste free and it's an easy task of throwing some in with some warm water and letting it sit there for ten minutes getting it's clean on. 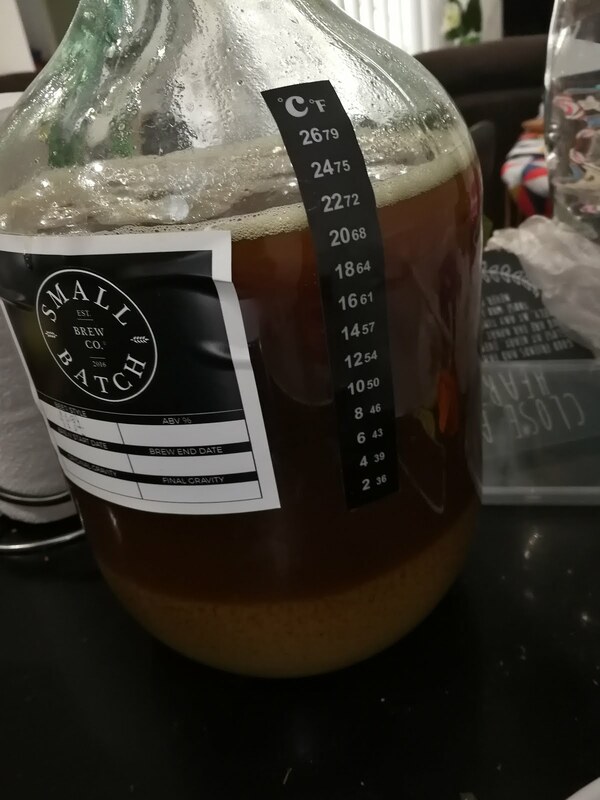 So the carboy, the pot, the airlock, everything. 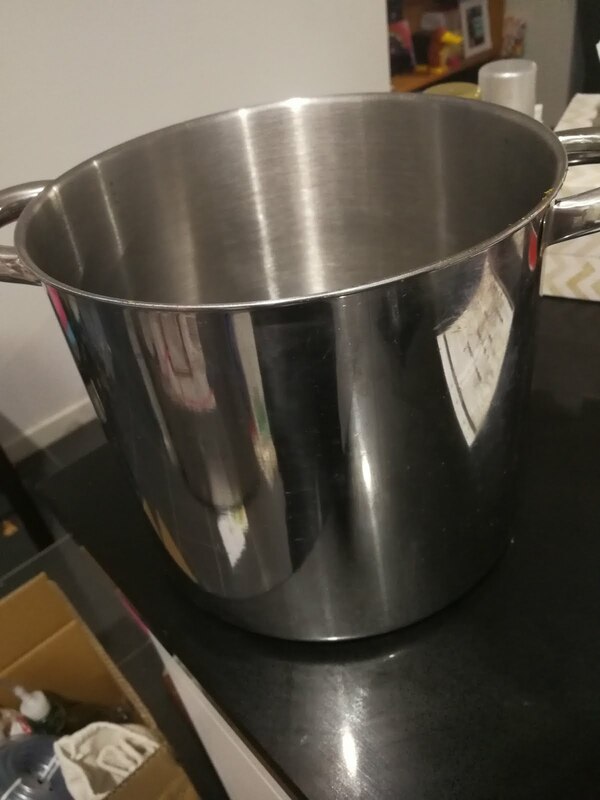 This is the biggest pot we have in kitchen. 'What happened to that even bigger one that I bought you one year for some celebration or something?' I asked my wife. It turns out during the move to the Gold Coast we gave it to her mum on account of possibly not needing it here. 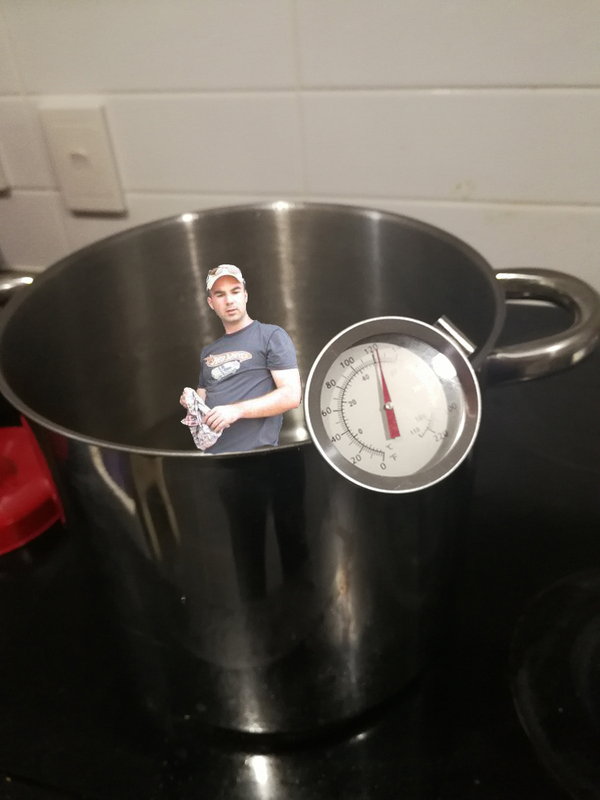 Mum, if you're reading this I sincerely hope you're still using it as it would have been brilliant in brew day. How big is this one? No idea really. 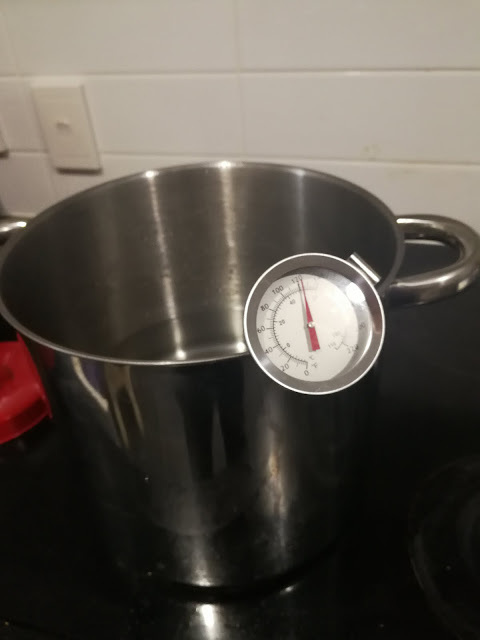 Turns out though I actually needed a bigger pot. Oh well, it's now on the shopping list for next time. Exact temp control was a little hit and miss with out rental house induction cook top. 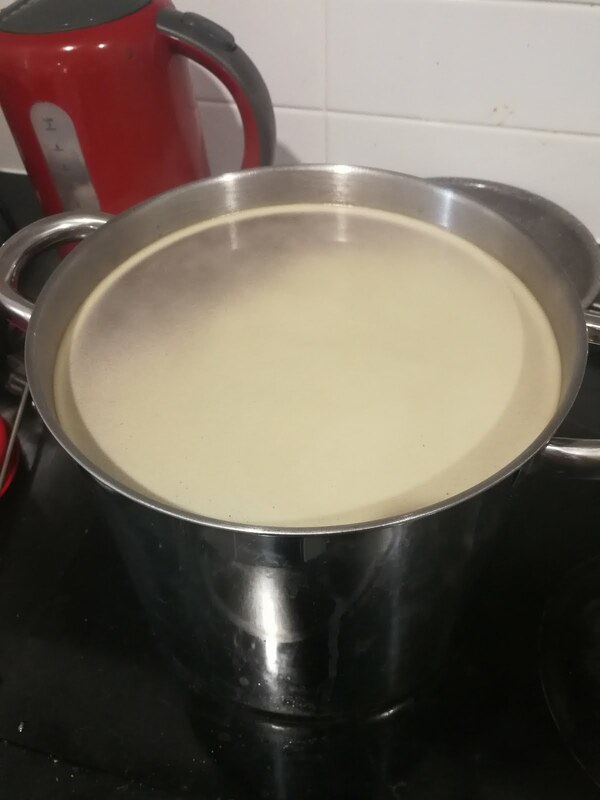 So for the mash/steeping I'd end up slightly over where I needed to be before turning it off, moving it off the hotplate for two minutes and then back again, turning it on when it cooled down some more. 'Can I help you with something please dad?' My son really wanted to give me a hand so I got him to hold the brew bag while I poured in the grains. This turned out to be a terrible idea as due to them being milled, there's a fine grain dust that ghosts it's way through the tiny holes into the bag and all over the floor. And of course once he finished helping me Jackson created a whole lot of IPA dust footprints up and down the house. Next time we do this over the sink. Still the grains stayed in the bag and into the steeping water they went. My god did the smell of this next step bring back memories of living near the CUB Factory in Abbotsford Australia. The smell that would waft over time on brewing time was just amazing. Incredible - barely a few minutes into today's beer production cycle and I'm reliving fond memories of growing up. This is wonderful so far. 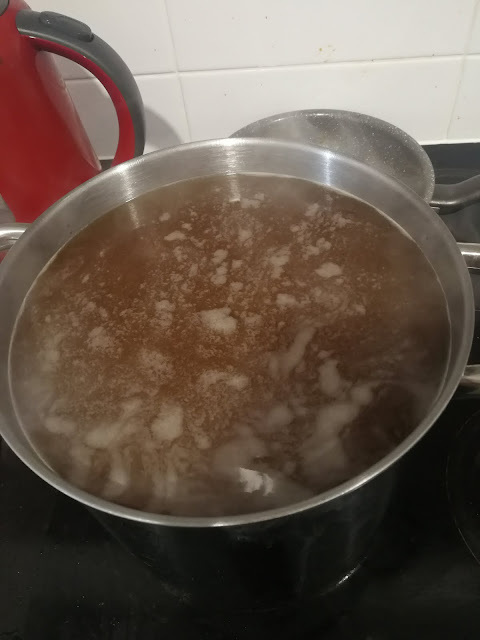 This is about the time when I discovered that my borrowed pot wasn't really up to small batch brewing standards - when I finished up the mash and added the extra water through the grains to eek out the last reaming sugars. 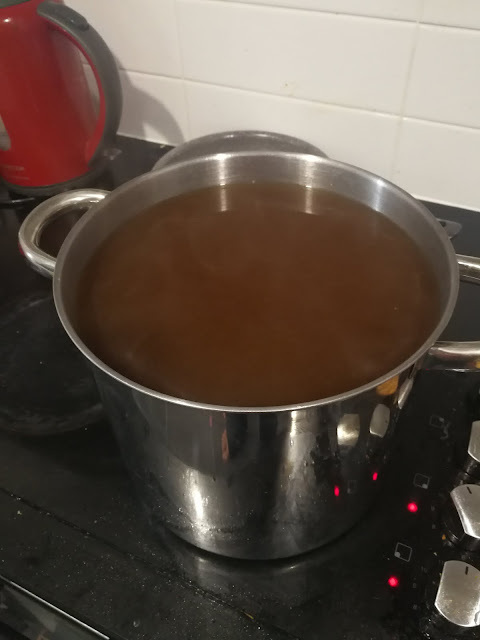 From memory I needed to add another 3.5 litres but barely managed to fit in 2.25 due to the fact that I still have to stir in the brew booster. Foolishly I scooped a couple of cups out and tossed it - in hindsight I probably put those cups in another small pot and chucked them back into the mix when some had evaporated down. 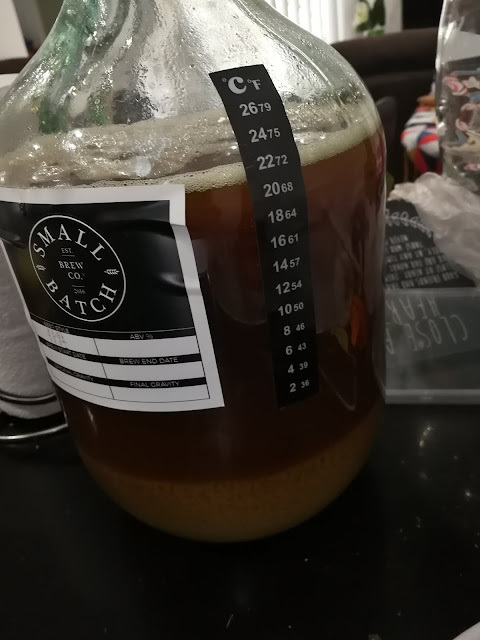 Still, looking pretty good for a first timer, especially when the booster went in and things started to look less like a plain coffee and more like a creamy coffee. A few minutes later, the first of three boilovers. 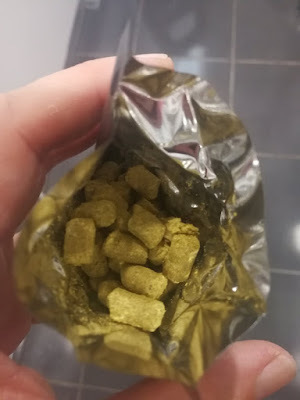 Make sure you have the right size pot first before anything kids..
Time for some hops and these warrior hops pellets smell incredible. Well to me at least, my wife sniffs the air and suggests it smells like those funky tomato plants that never actually grow any tomatoes. Bless her, she does worry about me a lot.. It's at this time I struggle with her digital scales that she scored from tupperware. I need 8 grams of these hops and the scale jumps from 0 to 15 and back again every time I even breath. So now it becomes a family affair as she has to measure things out before I get frustrated and hurl the damn scales out of the nearest window. Now on the shopping list digital scales for idiots. 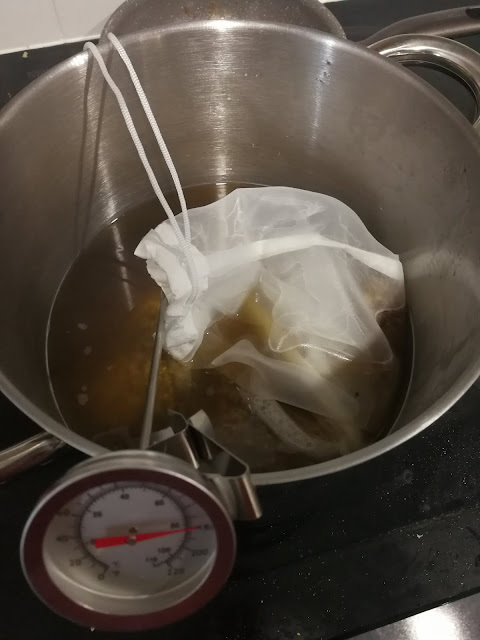 We're getting towards the end of our brewing time now. 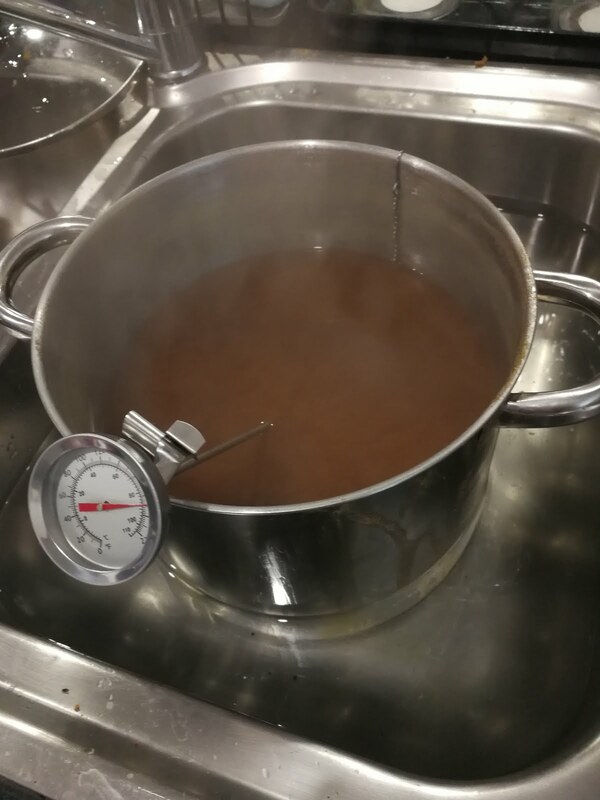 Some Citra hops join the Warrior hops in the hop bomb as well as a quarter teaspoon of something called Whirlflock. 'You'll have to pick up something to clean the stove up tomorrow' the wife chimes in. My god this looks scientific doesn't it? 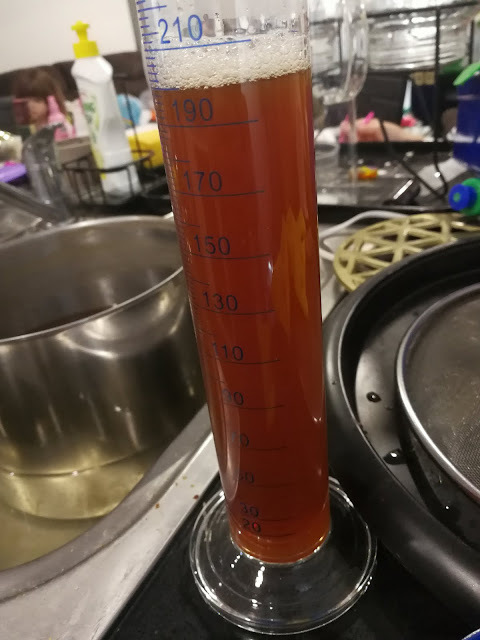 I'm measuring original gravity to compare it with final gravity at the end of fermentation to work out alcohol by volume. I'm still not sure if I did the part correctly but I sure pretended to look clever while I gave it a spin. Getting the yeast woken up and ready for their yeastie dance party. You have to let them relax and wake up slowly for 15-30 minutes so back to my book and coffee I went. Ahh glorious. About 3 and a half hours in the making all up but now we have a carboy full of beer with a blow off tube that helps it burp out co2. In eleven days time, we'll add some more hops. 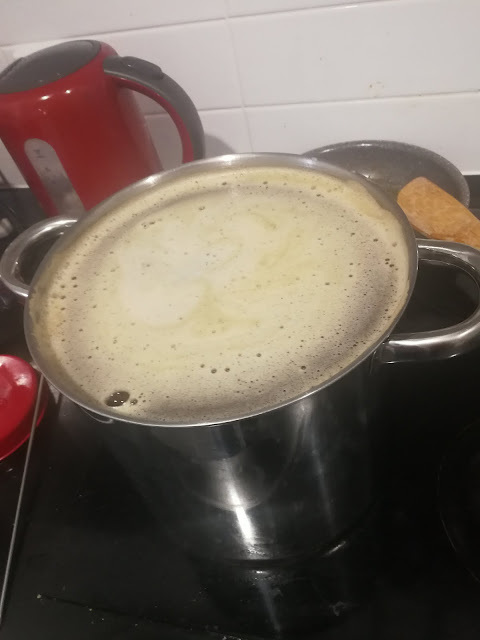 Missed any parts of Almigo brews a beer? Find them here! Paulaner Hefe-Weizen - Head for months!